My son, age 8, wanted to be Ash for Halloween. I took t-shirts, one white and one blue. I cut the blue shirt and used fabric glue to attach it to the white shirt. I used the bottom seamed edge of the blue tshirt to make faux pockets on the shirt. I bought yellow bias tape to make the faux zipper down the middle of the shirt. I used black fleece for all the black accents on the shirt. I cut the fingers off a pair of gray gloves and glued a band of red fleece to the end of each one. He already had to the hat to complete the Ash costume. 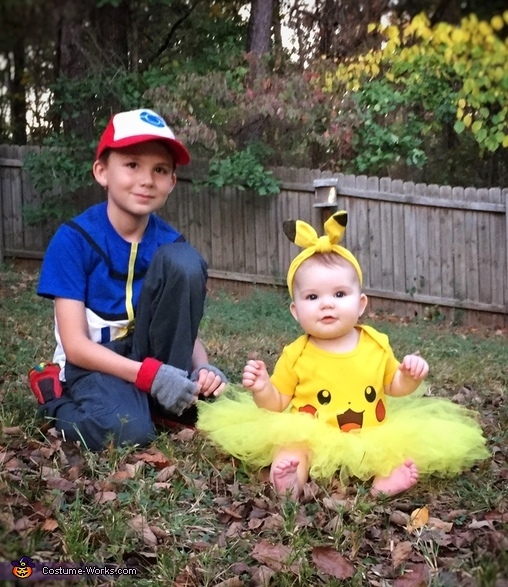 He wanted his sister, age 9 months, to be Pikachu. I made a yellow tutu out of tulle strips and a crochet elastic headband to go with the Pikachu face onesie. I made a top knot headband out of yellow fabric and hot glued pipe cleaners behind the back to make the ears stand up. I used black marker to color in the tips of Pikachu's ears.